Periodically I turn my blog over to a fellow journalist. 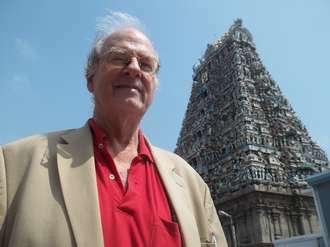 Today I am pleased to share a column by former Chicago Tribune colleague and foreign correspondent Don Kirk. Along with some 30 other journalists, Don attended the 40th anniversary of the Fall of Saigon April 29-30. He lives and works from various bases in Asia–most recently South Korea. SAIGON ― It’s become fashionable among intellectuals from left and right to talk about the Vietnam War in terms of “lessons learned.” Better yet, critics of U.S. policy write and talk about “lessons not learned.” One of the latter emailed asking me to tell him “in a nutshell” what would be the “lessons not learned” from Vietnam. I told him I couldn’t possibly answer that question so quickly but added I was pretty sure he believed he had all the answers. Yes, that response was rather sardonic. In fact, the person at the other end of the dialogue called me a “wise guy.” The reason for my sarcasm was that he obviously believes one lesson learned from Vietnam is that the U.S. should not dabble in foreign wars in relatively small countries for some ideological reason that is not worth upholding. He believes George W. Bush during his presidency made a huge mistake in getting involved in driving Saddam Hussein from power and then propping up a regime and an army that seems not too effective in fending off ISIS, the Islamic State of Iraq and Syria. Maybe so, but then you have to wonder what would have befallen Iraq given the chemical warfare waged against Kurds and the suppression of everyone else during Saddam’s ruthless rule. OK, he may not have had nukes, but he surely had them in mind while working on chemical and biological weapons of mass destruction. And, having gone into Iraq as Bush did, should President Barack Obama have withdrawn so precipitously? Now we’ve got a worse mess on our hands than ever. Such ruminations come up in discussion of Vietnam. What could have led the U.S. to send hundreds of thousands of troops here, only to pull them out under tremendous anti-war pressure? And how could we have disappointed millions of Vietnamese who had assumed the U.S. would always be on their side? But wait a minute. Asking such questions puts me in the camp of those who believe we should have invaded North Vietnam, should have maintained armies in neighboring Laos and Cambodia as well. There is something to be said for that view. If you’re going to fight a war right, you need to be free to invade the enemy’s territory and do what it takes to win. A real fear about the Vietnam debacle is that the U.S. did not have the will to fight. That fear is of relevance on the Korean Peninsula where the U.S. faces similar arguments when it comes to how to respond if North Korea opens a second Korean War. Plenty of North Korea sympathizers on American campuses argue the Americans should empathize with the North Koreans, should appreciate what’s going on in Pyongyang, should remove sanctions, sign a peace treaty and pull out U.S. troops. Would these same pro-North academics then be on the U.S. side if the North Koreans exploited such weakness and again invaded the South? Don’t be ridiculous ― they’d be at the forefront of anti-war demonstrations. But then, getting back to the Vietnam analogy, we have to ask, if the U.S.-backed Saigon regime had clung to power, with massive infusions of American aid, supported by U.S. airpower and ground troops, would Vietnam have been better off? Visiting the country these days, 40 years after “the fall of Saigon,” the impression is, the more things change, the more they stay the same. Saigon, renamed Ho Chi Minh City for the iconic Vietnamese communist leader who died in 1969 after the great offensives in which his forces suffered tremendous losses, now looks far more bustling and affluent than anyone ever thought possible. Still, are the Vietnamese of Saigon free and happy under current rule from Hanoi? Maybe not, but the spirit of capitalism is born again, as in some fundamentalist evangelical religious cult. All that’s not to justify whatever happened in Vietnam, just to give an idea of what’s happening now. The fact is the Americans still betrayed a few million Vietnamese who had to flee, many dying on dangerous journeys by sea. One lesson learned from that war is the U.S. should not betray its friends and allies as it did the South Vietnamese. Those who talk pro-North in the U.S. should consider the consequences if the U.S. ever were to abandon South Korea. They might ask what would happen if North Korea finally did live up to its rhetoric and attacked the South while China and Russia, for their own opportunistic reasons, as in the Korean War, saw the advantage of supporting the North? That’s a question that no one really is asking, much less answering, while Americans still deal with their betrayal of the South Vietnamese. Columnist Donald Kirk, www.donaldkirk.com, covered much of the Vietnam War and has reported off and on from Korea for years. He’s at kirkdon@yahoo.com.